Six Flags America in Upper Marlboro, Maryland offers a full day of fun with more than 100 rides, shows and the largest water park in the Washington, DC area. 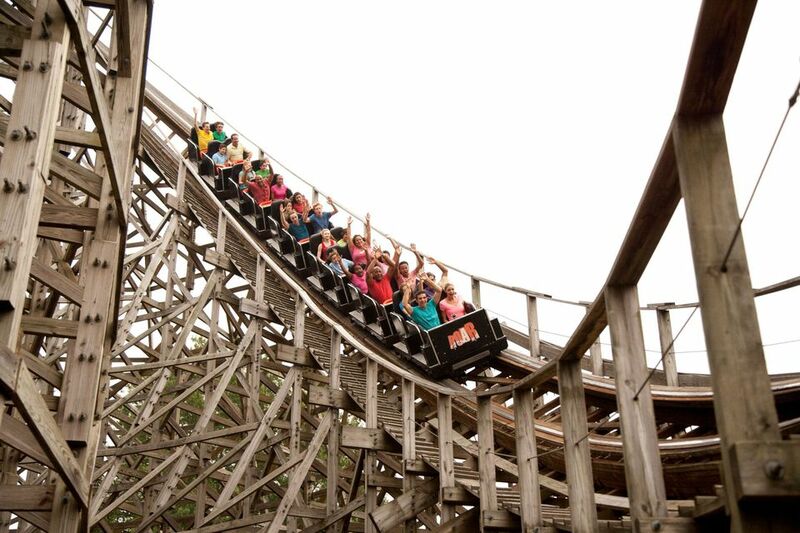 The amusement park has several roller coasters with names like Wild One, Joker’s Jinx and Superman Ride of Steel. Family rides at Six Flags America include The Penguin’s Blizzard River, the traditional Tea Cups, and The Great Race. Younger kids enjoy the Looney Tunes Movie Town, where they can meet Bugs Bunny. Hurricane Harbor features one of the largest wave pools in the country, water slides, inner tube flume, lazy river, splash pool and more. Admission to the water park is included in the Six Flags ticket price. For the 2016 season, rollercoaster SUPERMAN Ride of Steel will open with beautiful new trains and a fresh facelift in preparation for the summer launch of SUPERMAN Ride of Steel Virtual Reality Coaster. The redesigned coaster will offer a realistic 360-degree virtual world transporting thrill seekers to an entirely new dimension. An entire fleet of new vehicles will be launched at the Big Easy Speedway (go-karts) as will new cars at family favorite, Coyote Creek Crazy Cars (bumper cars). Splashwater Falls opens at Hurricane Harbor. The new, multi-level water play attraction features dozens of slides, nets, sprays and geysers, plus a super-sized tipping bucket.·Be sure to come back in December for Holiday in the Park, the brand new seasonal event with millions of dazzling lights, live entertainment, seasonal treats and of course – a festive selection of theme park rides. In 2015, Bourbon Street Fireball, a seven-story looping roller coaster opened in the Mardi Gras section of the park. The coaster will seat 24 passengers in forward and backward, face-to-face position. It will use a pendulum style takeoff with multiple 360⁰ revolutions. In 2014, a newly themed Mardi Gras section opened, featuring a fun, family-friendly, flying ride dubbed French Quarter Flyers. Memorial Day weekend, the park will debut its 9th roller coaster, Ragin’ Cajun, a spinning, fast-track roller coaster. The entire Mardi Gras area has been transformed with existing rides re-themed and the addition of new retail, games, and fun refreshments at Hurricanes, which will serve adult beverages and light fare. 13710 Central Ave. Upper Marlboro, Maryland. (301) 249-1500 and (800) 491-4FUN. Six Flags America is located on Route 214, Central Avenue, approximately five miles from I-495 just 30 minutes from downtown Washington, DC. From Washington DC: Take I-495 to exit 15A, Central Avenue East. Six Flags America is located approximately five miles from the exit, on the left. From Baltimore and Areas North: Take I-695 to Exit 4, I-97 South. Follow I-97 South to Exit 7, Route 3 South towards Crofton/Bowie. Route 3 becomes Route 301 South at the Route 50 intersection. Stay on Route 301 South for approximately five miles. Exit onto Route 214 West, Central Avenue. Six Flags America is located on Central Avenue, approximately three miles from the exit, on the right. From Virginia and Areas South: Take I-95 North to the towards Baltimore. Take Exit 15A, Central Avenue East. Six Flags America is located approximately five miles from the exit, on the left. Six Flags America opens for the 2016 season on March 25 and is open daily for Spring Break through April 3 and then weekends in April and May, with daily operation resuming Memorial Day weekend. Hurricane Harbor begins its season on Saturday, May 28. Hours vary throughout the season. After Labor Day weekend the park is open weekends through October. New this year, the park will be open for the winter holidays (dates to be announced). Attend special events - including July 4th Fest, National Funnel Cake Day, National Coaster Day, the SIXtreme BMX Stunt Show, Fright Fest and many more. This location of Six Flags America was originally built as Wild World water park in 1982. The water park went bankrupt in 1990 and was sold to new owners and was renamed Adventure World in 1991. In 1999, the park was bought by the regional theme park company, Six Flags America, and expanded to include roller coasters and rides based on DC Comics characters such as Superman and The Joker.